With the new Provider Look-up and Network Search (PLANS) tool, you can locate healthcare providers by zip code radius and/or provider type. The Sales Forum features a combination of main stage and breakout sessions delivered by industry experts, top producers and representatives from our carrier sponsors. In this webinar, we show you five free tools that you can use to improve your website. You Built a Website, Now What? Learn how to market your website, leverage social media and email. Agent Methods online marketing platform offers a simple, yet effective solution. Learn how our free Social Security Calculator works as a Door-Opener for Medicare products. As a Medicare Agent in the Senior Market, you're in a perfect position to help raise awareness of the thousands that are at stake when electing Social Security benefits. Senior Market Sales' Ardey Clark demonstrates how to use Mutual of Omaha's e-App. Learn the art of phone consultation and why you should be selling over the phone with Senior Market Sales' Ardey Clark. Great news! 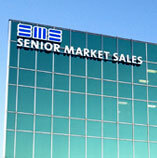 Senior Market Sales' agent E&O insurance program will renew on September 1 with no premium increases since 2009! SMS is the IMO for tomorrow’s agent. Our tools and technology are designed to help you save time, eliminate mistakes and make more sales during the busy AEP. The Medicare Advantage industry made a historic technology leap this AEP when SMS agents in Rockford, IL, completed the first MA enrollments using an iPad app. Developing a marketing plan will help you establish exactly who you are, who you are trying to reach and what you are trying to accomplish. According to a recent study, 51% of pre-retirees and retirees had not been contacted by any kind of retirement professional in the last year. Responding proactively to a crisis will calm client fears and reinforce your value as an advisor. Learn how to build your crisis communications plan. One well-known strategy for creating a steady income stream is annuity laddering or buckets.